« Is free legal music service Qtrax too good to be true? Bernstein Research analyst Tony Sacconaghi estimates that more than a quarter of the iPhones sold in the U.S. have been “unlocked” to work on network providers other than officially sanctioned AT&T. 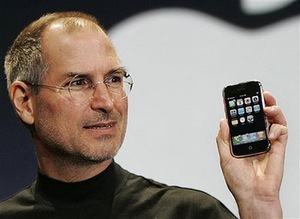 That’s about 27 percent of the iPhones sold in 2007. It works out to about 1.45 million handsets. Even if they are estimated, these numbers mean that an amazing number of people have taken the time, effort, and trouble to unlock the phones, no matter the complexity or risk. Some of these people are techies and hackers who are comfortable messing around with the innards of electronic equipment. But to hit these numbers, it means that a whole lotta average folks are unlocking their iPhones or — more likely — paying a cottage industry to do it for them. Finally, these numbers are further evidence that people in the U.S. want honest to goodness open networks like the kind enjoyed by mobile users in Europe, Asia, and elsewhere in the world. The Federal Communications Commission has taken notice, mandating that the winner of a part of the 700 MHz spectrum auction that’s currently underway will open the network once it’s built. But people will not want to wait until 2010 or 2015 for these networks to be built, tested, deployed, and operational. It’s clear they want open networks now, or more likely they want to use a cool, user-friendly device like the iPhone, forget about the network. And think about the pressure this puts Apple and AT&T under. Spokespeople for both companies declined comment, but their silence still says a mouthful. The unlock situation is only going to get worse. Apple supposedly signed an exclusive distribution agreement with AT&T for 5 to 7 years, depending on who you believe. To offer the iPhone on another network in the U.S., the phone must be sold unlocked to GSM providers (like AT&T and T-Mobile) who use SIM card technology. But Verizon’s network, the No. 2 in the country, uses the CDMA platform. What are the chances that Apple will unveil a CDMA version of the iPhone later this year? And for AT&T to work out some sort of agreement with Apple to allow the iPhone to be sold by other carriers? It’s wishful thinking, no doubt. But apparently a heck of a lot of people are already doing something about it. Correction: Towards the end it should be GSM providers, not GMS. What’s Apple going to do about it? Continue to “break” the unlock process with each new software update. Not much of a deterrent if you just never update your software. And I doubt many of the unlocked phones are being used in the US. It’s one thing to get an unlocked iPhone when you otherwise can’t have one at all in your country, but in the US my guess is that most T-Mobile customers would just switch to AT&T rather than bother with an unlocked phone. Many people in South Asian countries like Pakistan and India have great demand for iPhone… apple needs to focus. Yeah that’s true. South Asian countries have a great demand. I know dozens of friends in my circle who are crazy about getting an iPhone. It’s such a wonderful thing to have with one..
People don’t like being locked into anything, simple as that i don’t like networked locked anything. As soon as I can get it unlocked I will.